Antennae grown with genetic algorithms capture cosmic radiation echoing since the beginning of time, which is processed by a live ant colony, gathering and moving in patterns offering a tool in which the world's most populous insects extend human perception, reveal and then retell the story of all existence. Genetically grown antennae capture signals from the cosmic microwave background, which began echoing in space since the Big Bang. The signals are processed by a computer system and translated into shapes of food, water, and pheromone trails in real-time. Ants gather and move according to these patterns, revealing the activity of the most abundant source of radiation energy ever known. From a distance, the sculpture appears to be a gigantic ant peeking into the human world. Upon closer examination, the human peeks into the ant world and is presented with patterns formed by the ant colonyʼs social mind. The uniting force behind our work is a mission to create emotionally engaging biological media. This has led to the focus on developing an aesthetic framework and a pattern language unique to biological art. In order to build and refine this, we create living interactive systems and then study the spectators of the installations. Our recent biological ambient media examined the use of bacteria in one case, and plants in another as simple vehicles for the encoding of information and an abstract form of telepresence. With exist(ants), insects present a big leap in the sophistication and complexity. Ants are surprisingly advanced with a highly developed social structure. 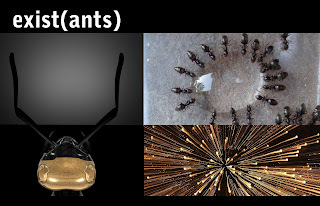 In the exist(ants) project, the behaviors of a colony of insects extends human perception allowing the visualization of the cosmic microwave background. The installation explores the role of the author as a choreographer who prepares the stage and then leaves the actual creation of the moment-to-moment experiences to the performers. A genetic algorithm based on the antennae of the ant is used to grow a highly tuned antennae to capture signals in the 0.3 GHz and 300 GHz range. These signals are then translated into shapes using a visualization algorithm and then “printed” in the ant habitat with the placement of food, water, and pheromones in real-time using bubble jet technology, thus influencing the gathering and movement of the ants. 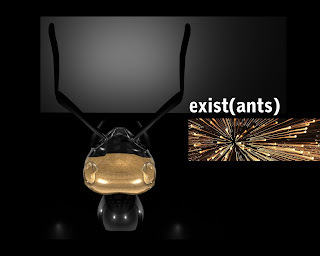 exist(ants) raises issues on various levels relating to the logic of natural processes. The notion of all existence as a delicate balance between chaos and order is a primary function of this installation. As time passes, the ant colony changes and refines its ability to process the cosmic signals that have echoed since the beginning of time.